This is an excerpt from an article originally published in Climate Home News. With its empty platforms and chairs, a deserted car show in Tehran would delight most ecologists. Not Hamed Ghazi, a softly spoken Iranian from environmental NGO Cheeco. Far from representing a change of heart towards cars from consumers, the ghost-like foreign section of 2019’s Tehran car show indicates the exodus of innovation from the country since Donald Trump’s U.S.-reimposed sanctions in November 2018. “As companies from developed countries leave the market, we are worried about one thing: What will happen to Iran and the region, once the polluting industry has replaced the modern one due to U.S. sanctions?” Ghazi told Climate Home News. France’s Renault, Japan’s Mazda, and South Korea’s Hyundai are among the car manufacturers to have pulled out of the Iranian market. Gone are the fuel-cell cars promised by Toyota and Hyundai in 2018, or the deals struck between Iranian carmakers Iran Khodro (IKCO) and Saipa with the French PSA Groupe’s Peugeot and Citroen brands. Instead photos circulated on Twitter show a straggle of Chinese four-by-fours standing alone, while Saipa is showcasing only one new model – a midsized sedan named Roham. The event is a flop. But the need for new, cleaner technologies is desperate. There are 35,000 deaths from air pollution in Iran every year, according to the government. “When sanctions are imposed and car manufacturers such as Peugeot and Renault leave, we have to fall back on engines produced locally and of subsequently poorer quality,” Iran’s vice-president Issa Kalantari told AFP in October. Roughly 127,000 vehicles 35-plus years old are still on the roads, according to roads minister Abbas Akhoundi. “Dilapidated trucks in Iran are estimated to produce 30 times more harmful emissions than new models,” Rasoul Mohammad-Sadeghi, head of Saipa Diesel Company, the trucks and trailers division of Iran’s second carmaker SAIPA, told the Financial Tribune. The same goes for fuel. Under pressure from sanctions, the country has had to turn its petrochemical factories into oil refineries to produce its own petrol. Iran cannot import the higher quality additives necessary for cleaner fuel, which forces it to rely on homemade cocktails. Other sectors key to a green transition have also taken a hit. Faced with such a pollution crisis, Iran has been trying to increase the share of renewably produced electricity in its energy mix. It hopes to achieve 5 gigawatts by 2022. But the sanctions could dent that effort. In August, British renewable energy investor Quercus announced that it was ditching the construction of a €500 million solar power plant. 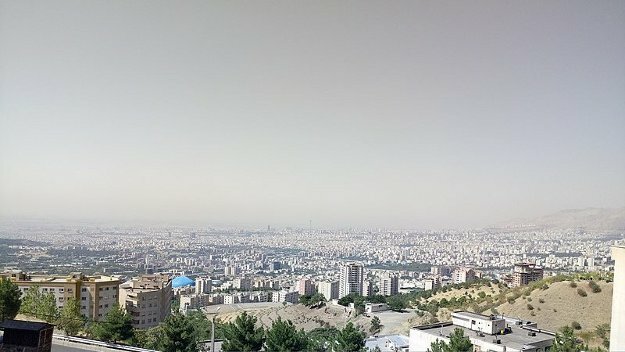 Norway’s Saga Energy has also had to suspend plans to build 2GW of new solar capacity in Iran by the end of 2018, while energy giants like Siemens said that they simply couldn’t consider new deals with Iran. “The most difficult problem that the market is facing right now is that, yes, there are people willing to invest in the renewable sector, but there are no materials,” said Morteza Sabbaghzadeh, a business consultant at solar firm Arias Solar who has worked in Iran’s renewable sector for 10 years. Left to their own devices, Iranian companies can design and install renewable plants of up to 1MW, said Sabbaghzadeh. In the past, larger power plants have been installed by foreign companies from Germany, France, Italy, Spain and Australia. Sanctions also affect money transfers. “There are Iranian investors who are willing to invest, but they’re not capable to buy the products, or transfer the money. This has been more difficult after Trump announced the last sanctions,” said Sabbaghzadeh. In June, before the resumption of sanctions, more than 250 companies had signed agreements to install and sell power from about 4GW of new renewables in the country. Only 602MW of this has been set up, according to Reuters. It is less than four years since the country looked to be opening a new chapter of broader relationships when they agreed with the U.S., EU and other partners to limit their nuclear research program. But Shirin Hakim, a PhD student at Imperial College London studying the impact of U.S. sanctions on Iran’s environment, said the environmental sector was now suffering a brain drain. Sanctions also jeopardize international lending earmarked for environmental projects. A recent report on the impact of Iranian sanctions by the U.S. Congress Research Service noted that “Iran’s efforts to deal with environment hazards and problems might be hindered by denial of World Bank lending for that purpose”.